A couple of months back I borrowed the book 150 Best Diabetes Desserts from the library and liked the recipes in it. So I was thrilled to find the same book in our library’s used books sale for a dollar. The book has recipes for cakes, muffins, quick breads, cookies, cheesecakes, etc. These recipes are not sugar free but they use considerably lesser amount of real brown and granulated sugar instead of artificial sweeteners, which is the main reason I got this book. 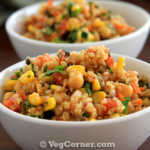 Most of the recipes use healthy ingredients like whole grains and flours, unsweetened applesauce, yogurt, flax seed meal. 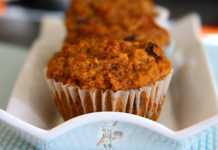 I tried a oatmeal raisin muffin recipe before and loved it. This time I wanted to bake something with pumpkin puree because I had some leftovers after baking these pumpkin cupcakes. There was a pumpkin bran muffin recipe, pumpkin quick bread recipe and a pumpkin cheesecake recipe. I decided to go with the pumpkin bran muffin recipe because I had some All Bran flakes too. The original recipe was not egg free but I made some changes to make it vegan. Also I used some plant based protein powder, hemp seeds and avocado oil to boost the nutritional value. The muffins turned out great and everybody in my family including my 3 year old loved it. The recipes in the book has the nutritional values but what’s intriguing is that they don’t have the amount of sugar but just starch. So I set out to find it myself especially because I have changed the recipe quite a lot. When the calculation was done I was surprised to see the quantity of sugar in each muffin; 18.5 gm. That’s a lot per serving in my opinion, which made me thinking, if a low sugar recipe has 18.5 gm of sugar imagine how much does the coffee house and store bought muffins have? If you are a diabetic and want to use the recipes from the book please make due diligence by finding out the information you need to know. Preheat oven to 400F/190C for 15 minutes. Line a 12 cup muffin pan with paper liners. In a large bowl stir together the dry ingredients and set aside. In another medium size bowl mix together wet ingredients. Beat it well with a wooden spoon. Pour the wet ingredients over the dry mix and combine until just moistened. 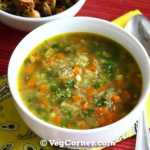 You may need to add another tablespoon or two of water/milk to get the right consistency. Use an ice cream scoop or a 1/3rd measuring cup to fill the paper liners with muffin batter. Divide the batter evenly among the 12 cups and bake for 17-20 minutes or until a toothpick inserted in the center of the muffin comes out clean. Mine was done in 18 minutes. I used Complete Green Protein powder which is a plant based protein shake. 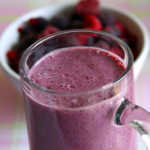 This is sweetened with Stevia so it’s very sweet and because of that I cut back the sugar from 3/4th cup to 1/2 cup. 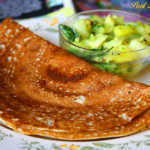 I used coconut palm sugar because it has low GI value when compared to brown sugar. These are delicious! Are they suitable for freezing? Yes it should work Annie. Wrap individually once cooled completely and store it in in zip lock bags and thaw it whenever needed. 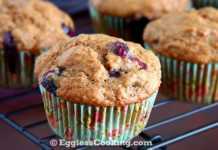 Hi Madhuram, what a great idea to add protein powder to the muffins. 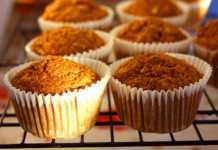 Pumpkin muffins are also perfect for this time of year and with the bran I can’t think of a healthier snack. Thanks for dropping by Vaishali. Hope you are doing great! Have you ever tried Arbonne’s plant based protein powder? 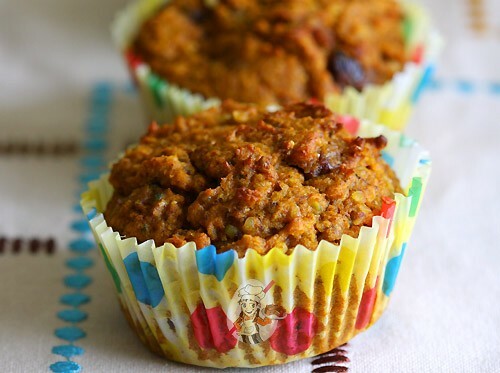 I have to look for protein powder, such a beautiful and super moist healthy muffins.